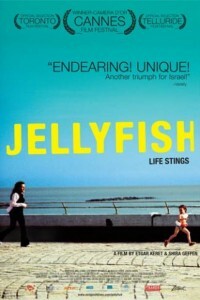 Poignant, often witty and exceedingly cinematic, “Jellyfish” (MEDUZOT), tells the story of three very different Tel Aviv women whose intersecting stories weave an unlikely portrait of modern Israeli life. Batya, a catering waitress, takes in a child apparently abandoned at a local beach. Batya is one of the servers at the wedding reception of Keren, a bride who breaks her leg escaping a locked toilet stall, ruining her chance at a dream Caribbean honeymoon. And attending the event with an employer is Joy, a non Hebrew-speaking domestic worker who has guiltily left her son behind in her native Philippines. As this distaff trio separately wends their way through Israel’s most cosmopolitan city, they struggle with issues of communication, affection and destiny—but at times find uneasy refuge in its tranquil seas.